There’s a signal for that! 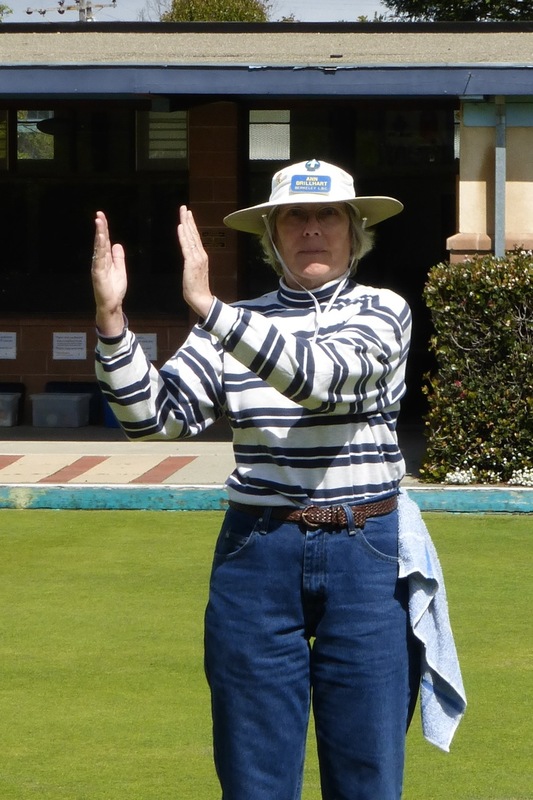 One of the nice things about lawn bowling is the peaceful nature of the game! None of that incessant clatter of bowling pins and balls being launched. Ann is asking that I move the jack 6-8″ toward the center line. Ideally, much of the necessary communication between the skip and his/her team, can (should?) be handled with easy to see hand signals. The most common signals are exchanged during the centering of the jack when the lead stands on the mat and shows the skip which direction and how much to move the jack to get it on the centerline. Hands apart, above the shoulders, both held on the side of the body the jack should move indicate the direction and magnitude of the move. Hands apart, move it further; hands closer together, move it a little. Then, when it’s right, the well-known field goal signal. Reporting the score is another thing best handled with hand signals. The lead or vice-skip reports the points to the skip on the other end of the green as follows: If your team scored 3 points, use your right hand to pat your left shoulder 3 times; If you team lost those 3 points, slap your thigh3 times slowly. In both cases, move slowly and try to be sure the skip is watching. There are many more useful hand signals – seek them out. Use them whenever possible instead of hollering back and forth. If you really need to talk, the person in possession of the mat can visit to the head to see the situation. Previous PostImproving your deliveryNext PostThe green is aerated and ready to bowl!